Trivia Crack is one the most addictive quiz games released for the Android platform. Such is the popularity of this game, that developers launched another game, which is equally immersive and engaging. TC has two play modes: Classic and Challenge. In Classic mode, the goal is to answer questions correctly to collect characters. The player with maximum number of characters wins the game. Most questions are randomly asked to you and your opponents. Some questions might be easy to answer, but the game won’t let you win easily. Several questions are submitted by users, so expect some tough ones from them. 1. Before start of play, be ready with your laptop. Open your browser and go to Google.com. You may use another mobile or tablet PC to search for answers on Google in case you are traveling. 2. When the question appears on your mobile screen, don’t type the entire question on the search box. You have only 60 seconds so enter the key words from the question. For example: If the question is: “Where is the Ukulele originally from”, enter ‘Ukulele origin’ on Google search to find the answer. The result will be shown on the first page. 3. Use this trick for questions on topics like history, geography and science. You will be able to answer most questions, if not all. Don’t use this for picture-based questions. Another way to cheat at this game is to use a Chrome extension to answer all questions for you. But for this, you will need to play the game on Facebook on your Google Chrome browser. Go to the Chrome web store and search for “Trivia Cracker”. Install and download this extension to your browser. When a question appears on the browser screen, click on the extension on the top-right corner of the game screen, just beside the speaker icon. That’s it. The correct answer will be selected automatically. You have only 3 lives. Because multiplayer gameplay is asynchronous, you may have to wait for hours, even days (max 2-3 days for classic mode, after that, your opponent’s turn gets cancelled) before you can spin the wheel. Spend 1-2 lives to play classic mode or challenge mode. When lives refill after 60 minutes, use them to play another round of Classic or Challenge game. This way, you will get to start another game while waiting for your opponent from the first game. You can later go back to the first game when your turn comes. You can get free lives from your Facebook friends. Just tap on the heart icon and then tap on the “Ask your friends” button. Make sure you have linked your account to Facebook. You earn coins by winning challenges or unlocking achievements. 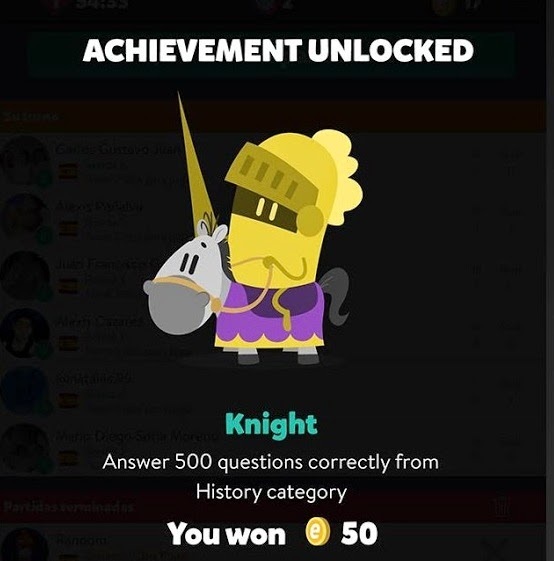 You will need to complete simple tasks such as winning games, signing in with Facebook and answering questions if you want to unlock achievements. You will get a full list of achievements by tapping on the three-line icon at the top-left corner of the screen. Winning a challenge earns you 3 coins. Collect coins to use them on extra spins. Extra spins can be extremely useful in situations where the spinner stops at an unwanted topic. If you are poor in a particular subject, say science or arts, just use those coins to re-spin. Who knows, you might get an easy topic next time? You can suggest your own questions via the Question Factory. Select a category or topic. Tap on the “Write a Question box” and type your question. Tap on the Correct Answer box and enter the right answer. You will also have to enter three wrong questions so that the game can notify the user whether the answer he/she selected is correct or wrong. Tap on Send once you have entered the question and answers in all fields. To start, tap to spin the wheel. The spinner will stop at a topic, such as science, history, geography or entertainment. A question related to the topic will be displayed on the screen. Choose the correct answer from multiple options. You win if your answers are correct and your opponent’s wrong. Wait for your opponent’s turn to answer questions to complete a round. You will need to answer three questions correctly to earn a character. You will find a segment meter at the bottom of the screen. For example: If you answer questions in any three subjects correctly, the segment meter will fill up. The catch is that you will need to give 3 correct answers in a row. The meter won’t fill up if your second answer is incorrect. Once the meter fills up, choose a character and answer a question. If the is correct, you win that character. Many times, the spinner stops at the Crown icon. Don’t miss this opportunity to earn a character. You have two options – 1. Challenge: Choose a question/topic for him to steal his character and 2. Crown: Select a character and answer a question correctly to earn it. Choose an easy category/subject from the list. If you are a history-buff, then choose the yellow character. Make sure you choose a character which you haven’t earned yet. Answer the question and if it is correct, and that character will be yours.